CARIA. Kaunos. Circa 490-470 B.C. AR stater. 11.79 gm. 18 mm. Period I. Aiginetic standard. 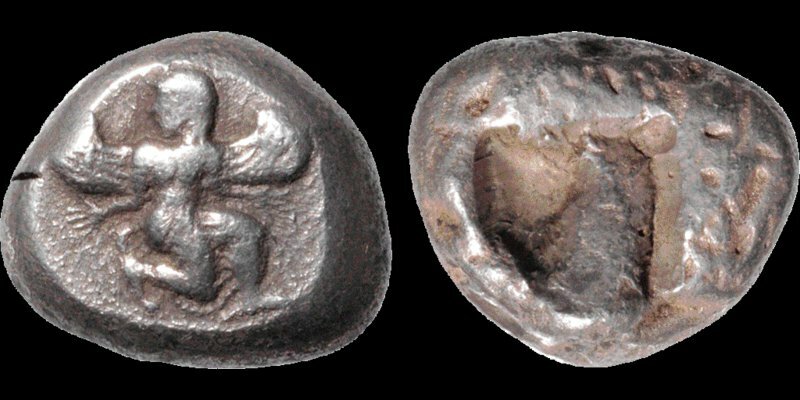 Iris in kneeling-running position right, head left, with curved wings and outstretched hands / Crude conical baetyl within incuse square. Konuk 13 var (these dies not shown). Very Fine; well centered; attractively toned; soil adhering on reverse. Nice example of this scarce archaic type. Ex W.B. & R.E. Montgomery Collection.